Despite the ongoing recession and people’s investment portfolios at next to worthless, Austrian jeweller Peter Aloisson decided to create the most expensive iPhone 3G, the “Kings Button”. I am pretty sure this iPhone is the only iPhone with that much bling-bling on it. The price tag? A freaking $2.5 million (S$3.875 million)! 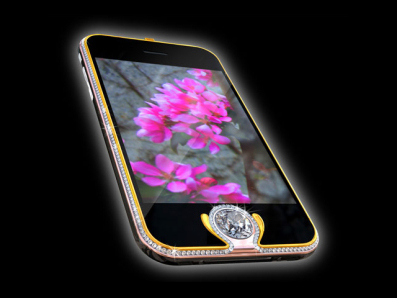 The home button is bedazzled with a 6.6 carat diamond and the case is remade out of solid 18-carat yellow, white and rose gold. What’s more? The jeweller finished off with a case outline of a white gold line encrusted with 138 diamonds “of the best quality”. Are you even tempted? With Apple going to release the usual upgrades for their products this coming September, there are many rumours that the new Macbook will not be only an upgrade in specifications. Rather, it will be an overhaul with the introduction of a glass trackpad and other design changes. It is said that the new Macbook will be made out of one piece of aluminum and thinner than the current Macbook and Macbook Pro series. Most websites place the release date during the last week of September. Here’s a video but I doubt Macbook Touch is coming this soon. It will be too much of an overhaul but it’s Apple. If they managed to pull it off, I can see more people jumping onto the Mac wagon with Vista not performing that well. Comments Comments Off on Macbook Touch Coming? Sometimes, I use Picnik for my web-based graphics editing needs but it looks like Adobe is ready to fill that slot with their latest Photoshop Express.The Beta is currently open and things are looking good for Photoshop Express. Adobe even bundled in a 2GB storage space and a gallery so you can edit and save your work using your free 2GB of space. The whole application is running in Flash so you will need Flash player in order to run the website. If you do not have it, you will be prompted to install so fret not. Most people I know has a mobile phone at the very least and a good many of them are iPod owners as well. ZAGG Inc. is offering a 50% discount on their usually pricey products. invisibleSHIELD is made from a material that was created to protect the edges of military helicopter blades so that’s how tough your invisibleSHIELD will be. I have seen the demo videos on their website as well. So far, it is very impressive just by throwing a mobile phone protected by invisibleSHIELD into a box of screws & nails and shaking the box around. The result? No scratch or damages done. You can get the discounted prizes through http://www.zagg.com/showspecial. By using that link, all of the prices shown will be the discounted prices. Grab a piece before the discount ends! I managed to get my order in a few minutes ago for my iPod Nano 2nd Gen.
Did I mention that invisibleSHIELD carries a lifetime warranty and also free international shipping? However, international shipping will take a longer wait unless you want to switch to the faster UPS. If your piece of invisibleSHIELD becomes scratched, torn or damaged, you can send it back for replacement. There’s also a 30-day Money Back Guarantee included though shipping cost is not refundable. For people who need protection of other gadgets, ZAGG offers custom orders as well especially for newer mobile phones or laptops. I came across Snapfish, HP’s photo service, yesterday and noticed that there’s a Singapore edition of the website. I went ‘Woot! Someone finally noticed the red dot on the map!’. Anyway, Snapfish is offering digital prints at S$0.19 for each print. I did some calculations and that comes to about S$0.224 per print if I am printing 55 4R photographs and inclusive of the S$1.90 standard mail cost. The cheapest I have seen so far is only S$0.25 for small amounts so Snapfish definitely catches my eyes for low-cost digital prints. What’s more? The prints are delivered to your door step or at least your mail box. For me, taking a bus to the shop and another trip to do the collection will exceed the S$1.90 mail cost. If that is still not enough to entice you, there’s more! Snapfish offers printing of posters as well as gifts. It’s definitely a unique gift for someone you love and the shipping costs are reasonable as well. From the looks of it, Snapfish is my current best route to printing digital prints since there’s only the need for me to upload my photos and wait for the delivery. At the moment, Snapfish is offering the first 20 prints for free not inclusive of the postal cost.